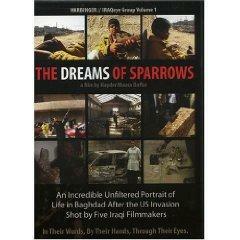 The film Marooned in Iraq from director Bahman Ghobadi is set shortly after the first Gulf War. An elderly Kurdish musician named Mizra (Shahab Ebrahimi) lives in a remote village in Iran. Mizra receives a vague message for help from his ex-wife Hanareh–a woman with a beautiful voice who left Iran where “singing is forbidden for women” to take her chances in Iraq. After receiving the message, Mizra gathers up his two middle-aged sons Barat (Faegh Mohamadi) and Audeh (Allah-Morad Rashtain) and they head into Iraq. It’s an arduous, dangerous journey. They pile into Barat’s old motorbike and sidecar, and leave the relative safety of their primitive village–equipped with little more than their musical instruments. Audeh complains loudly that he doesn’t want to leave his 7 wives and 11 daughters. Barat, on the other hand, is happy to accompany his father–although he doesn’t understand why Mizra making a near-impossible journey to help a woman who ran off with his father’s best friend 23 years earlier. On the way to Iraq, Mizra and his sons encounter hardship and adventure–including an aggressive bridegroom, camps of orphans, and marauding bandits. Mizra is famous among the Kurdish population for two things–his music and his cuckoldom. And these two things go hand in hand–the acclaim of the former soon brings on the memory of the latter. Whenever the three men stop and take out their musical instruments, crowds instantly gather. Misery and suffering take a back seat–at least temporarily–to the rare opportunity to experience the joy of music. The film does not contain a great deal of dialogue (Persian and Kurdish with English subtitles). The plot is sparse, and intense–yet the infusion of humour and hope combine to make Marooned in Iraq a superb film. Marooned in Iraq stands as a testament to the crimes against the Kurds conducted by Saddam Hussein, and for anyone interested in how Saddam was given chemical weapons in the first place, I recommend “Spider’s Web: The Secret History of How the White House Illegally Armed Iraq” by Alan Friedman. The director is Iranian, but I’m categorizing this film under Iran, Iraq and Kurdish for obvious reasons.